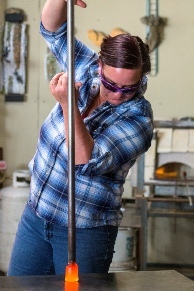 The Thompson family has been creating sculpture in molten hot glass together for over 18 years. Their artworks are an intelligent blend of contemporary, traditional and custom techniques that are further complimented by a diverse taste in modern sculpture. 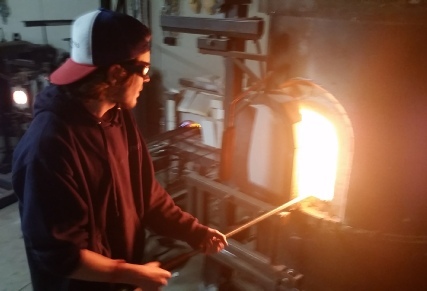 Their style is based in the traditional Italian method of glassblowing which utilizes a long steel blowpipe to ‘gather’ liquid hot glass from a crucible furnace. They are best known for their sea life sculptures, contemporary vases and large-scale installations. 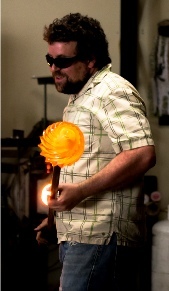 Jeff Thompson, a 4th generation Oregonian, has been working with molten glass since 1997 . Having immersed himself in the traditional techniques of Italian glassblowing Jeff now finds himself experimenting with his interpretations of this medium After being married for about a year Heather began to assist Jeff in the glassblowing studio and through teamwork, they are able to accomplish much more complex and difficult glassblowing projects. Now joined by their son Dale in the studio the potential for grand projects continues to expand. Currently their artworks are represented in fine art galleries all over the country and they were featured on Oregon Art Beat in 2007. “We are inspired to create glass sculptures in a broad range of styles. The desire of creation moves us into new realms every day we are in our studio. Working side by side and having the connection between us is a driving force in the studio,” says Heather.